The community museum. Is there a better way to understand your community? In this post, however, I refer not to buildings filled with artefacts, though these types of museums are great. Instead, on the eve of Halloween, I want to discuss every community’s best and most comprehensive museum: the graveyard. A wealth of artefacts and personal stories, the graveyard embodies the essence of a community. Who lived here? When? Was there disease? Who had wealth? Who had power? The graveyard knows it all. Nova Scotia’s Annapolis Valley – like most places – has such exciting graveyards. Do you need examples? The Starr family’s cemetery located in Starr’s Point. The graves of early settlers found in the Garrison Graveyard at Annapolis Royal. The Covenanters’ cemeteries tucked away in Woodville and Grand Pre. 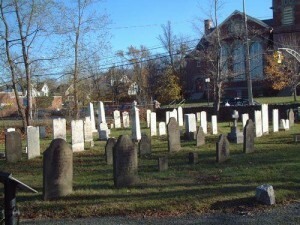 The oldest cemetery in the Township of Cornwallis located at Chipman’s Corner. There are plenty from which to choose. But it is the Old Burying-ground in Wolfville on which we will focus. Why? This graveyard has a number of interesting details for us to explore—its history, its people, and its stones. Let’s go graveyard hunting! This [sic] the Old Burying-ground along Wolfville’s Main Street is an inventory of the venerable names of those who first came here to found a community and a college. Resting as they do now, in dignity and quiet peace [sic] since the burial ground was opened in 1763, the townspeople interred here endure a lasting memory in the familiar names of their family members who have succeeded them—DeWolf, Bishop, Calkin, Benjamin, Davision, Reid, Harris, Wickwire, Godfrey. Although the cemetery is currently owned by the Town of Wolfville, this was not always the case. In the early days, the cemetery was primarily a burial ground for the Wolfville Baptist Church. Because of the close connection between the Baptist denomination and Acadia College, the Old Burying-ground is literally a “who’s who” of Acadia personalities. Stroll quietly through the cemetery and you will see them. Professor Isaac Chipman, his student Edward Grant, and friend Rev. E.D. Very are here. They, and several others, were on an expedition to Cape Blomidon, Nova Scotia, in 1852 when, on their return trip, their boat sunk and all were lost except one man—’the man from Gaspereau’. Rev. Edmund Albern Crawley, the third president of Acadia and designer of the first College Hall, also lies in the cemetery. Not only is Acadia University’s history tied directly to the Old Burying-ground, the community is well represented too. Here lies the Hon. William Johnson, Conservative Member of the Assembly. During his career as a postman, he may have been one of a handful of men who first referred to this town as “Wolfville”. You will find Elijah Elderkin and his wife Elizabeth, direct descendants of an original settler of 1764. Think of them as you pass by the market that bears the Elderkin name on your way out of town. ‘Copying down information.’ A key instruction for those looking to preserve these important places. Many stones, the artefacts themselves, are wonderful to behold when they remain intact. But not all stones have withstood the test of weather. Sandstone and slate are especially vulnerable. [a] gravestone is material evidence of an individual’s existence, proof that a real person lived and died. More than the inscribed information, a gravestone as an object can also provide data about the political, economic and social climate in which it was crafted. As part of her argument, she traces the economics of early settlement. Trask explores the rock used to make gravestones, revealing the connections a community could have with more distant places. She tells us that sandstone came from Saint John, New Brunswick, and from Connecticut. Slate quarries existed in Truro, Windsor, and near Granville, Nova Scotia. Trask and other authors use the carvings on the stones to trace the culture surrounding death. When examining the meaning of stones in the Garrison Graveyard of Annapolis Royal, for example, W.P. Kerr points to several types of decorations used on stones. Urns, willows, angels, flowers, obelisks, and skulls are all discussed in his 2012 book History Etched in Stone. Add to these the shapes of early headstones, as outlined by William Inglis Morse in Gravestones of Acadie, and you will begin to piece together the social-economics and culture of communities like Wolfville in the mid-1700s and early-1800s. Wendy Robicheau is the University Archivist at Acadia University in Wolfville, Nova Scotia. This text is a modified version of a public presentation she gave last week.